Welcome to January’s Fabulous Finds Friday giveaway! For many reasons I haven’t done any thrifting this month so far at all… so I went into my craft studio closet to see what I have stored away that really needs a new home. And I’m so excited because I found something awesome! A few awesome somethings actually. 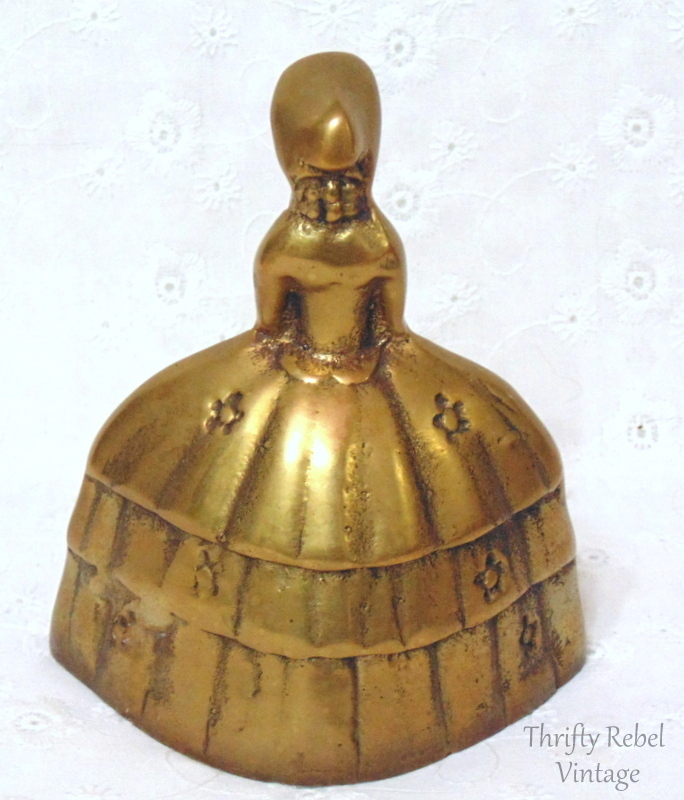 These three brass bells that I thrifted a while ago are just over 4″ high. They all still have their original clappers. That’s what the ball thingies that hit the inside of the bell are called. I googled it because I wasn’t sure. lol. 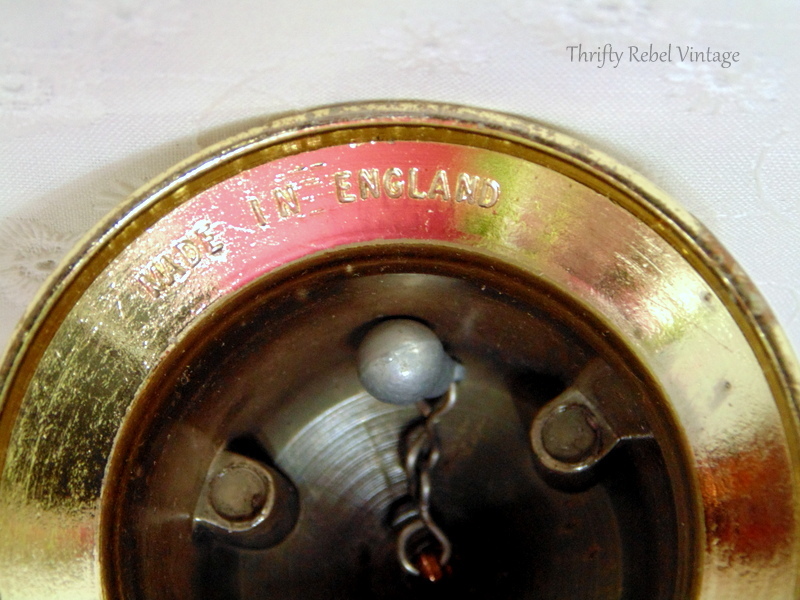 All three bells are marked Made in England. 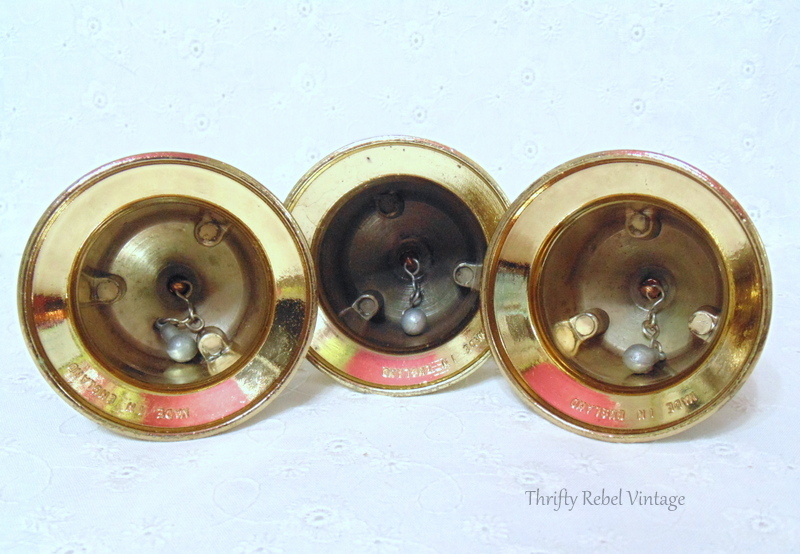 This lovely pair of brass candle sconces are about 7 1/2″ tall. They have lovely detailing on the bows and are marked Taiwan on their backs. 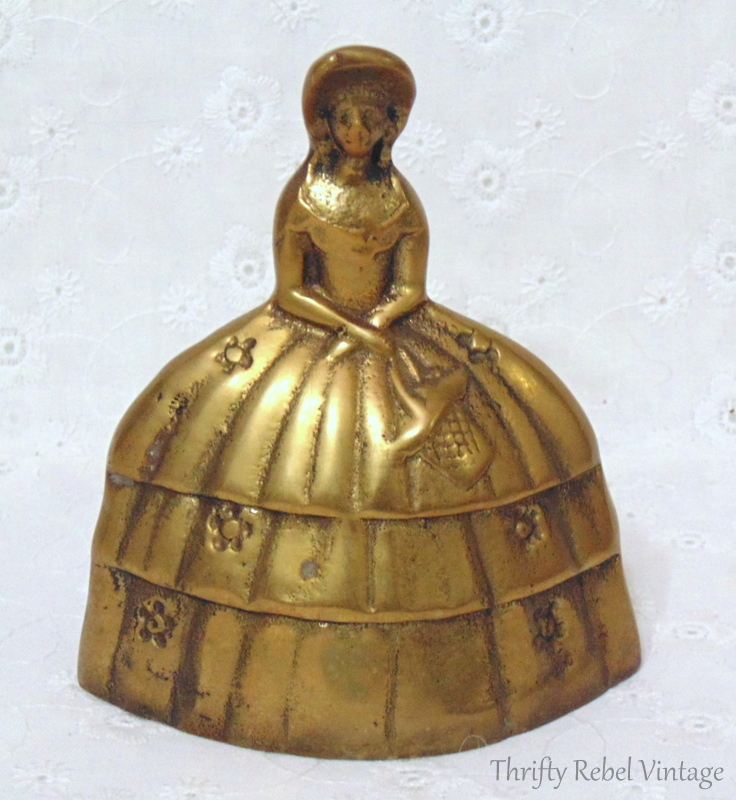 My favorite piece in this lot is this Southern Belle or Victorian Lady brass bell. I’ve seen her on Etsy described as both so I wasn’t sure what to call her, but to me she looks like a Southern Belle for sure. 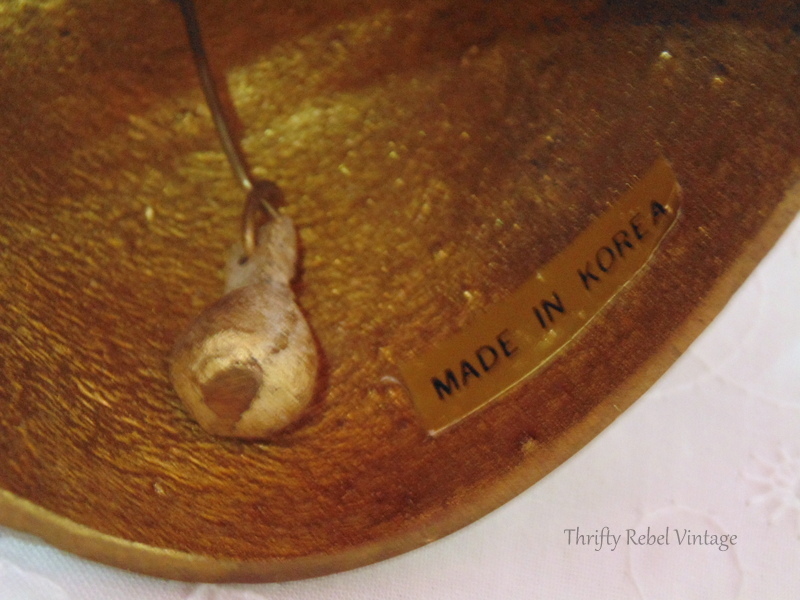 She’s just under 4″ tall, and still has her original Made in Korea label. She definitely shows some wear, but she’s still quite lovely. I’m so pleased to be offering this brass lot of treasures for this giveaway because they really should be displayed and enjoyed. Don’t you just love the aged patina of brass? For your chance to win this lot of brass beauties enter through Rafflecopter below and leave a comment on this blog post. I look forward to every email I get from you. Always like Christmas! 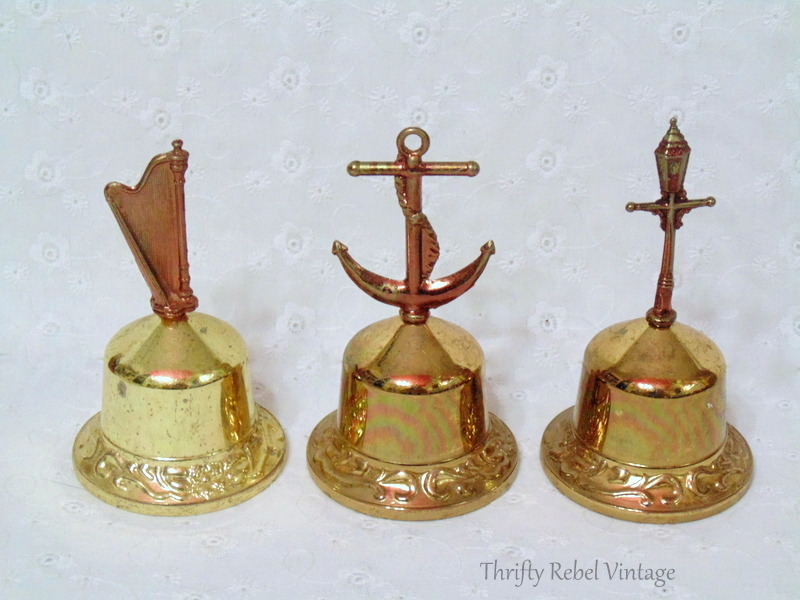 Gorgeous brass bells. I love bells and the sound of them. The Southern Lady has beautiful patina.
. I would love to have them, good luck everyone. I love the brass. They would fit right in my collection. 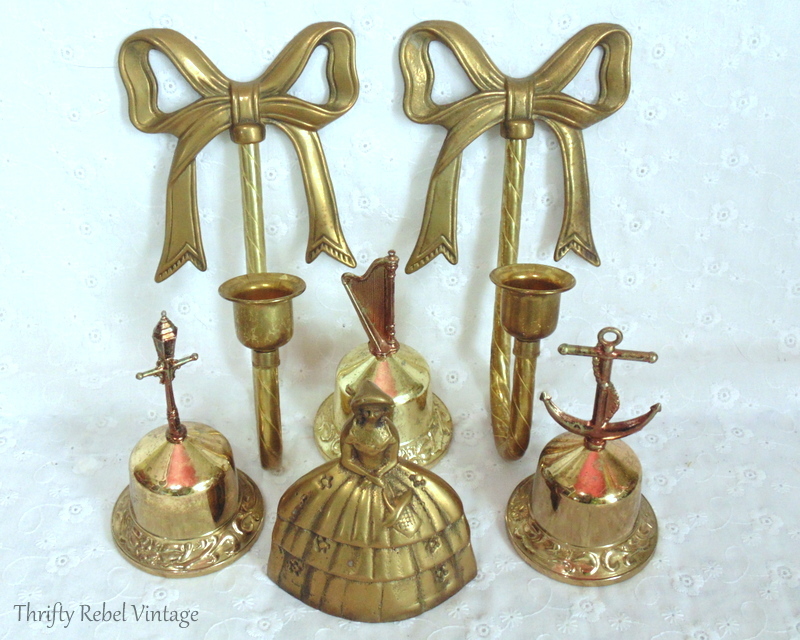 I especially love the bells, they are a special thing for me since I was a child. Best give away so far! What wonderful pieces. Thank you for the chance to win them. You are sooo generous with your treasures, Hoping to win, as I like brass very much. I have a few pieces sitting in my secretary in the living room. I’m sure I could find room for several more pieces as nice as these. Hope your new year is going better than mine…the Midwest has been hit with snow storm after snow storm. This wk-end is #3. Schools in the tristate area have been closed all week because of snow. freezing rain, high winds & lots of drifting in the rural areas. I live in West Central IL, right on the Mississippi River…right where IA-IL & MO meet. Temps are in the single digits. My aunt collected bells and often gifted me with special ones when I was a child. She has since passed on, but I still think of her each time I see pretty bells. Kinda like the angels that get their wings! And do I get my heart’s wish like when Andrew rings his birdie bell he gets catnip? Love the bells .My mother used to collect bells. After she passed, my siblings and I got back the bells each had given her as gifts through the years. 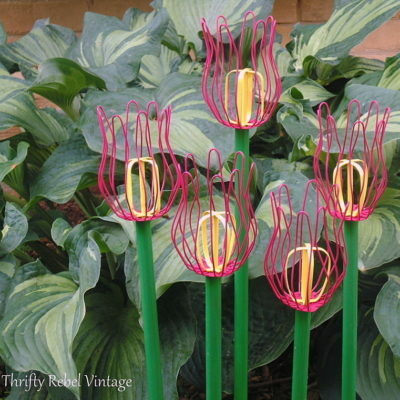 I think of Mom when I see bells and I know she would love these, as I do. Love the Southern Belle. Always enjoy seeing what you are doing! You find such wonderful things when you go thriftin wish we had some great catches around my area. Love the bells always a favorite of mine but the southern belle won my heart. The patina is great. 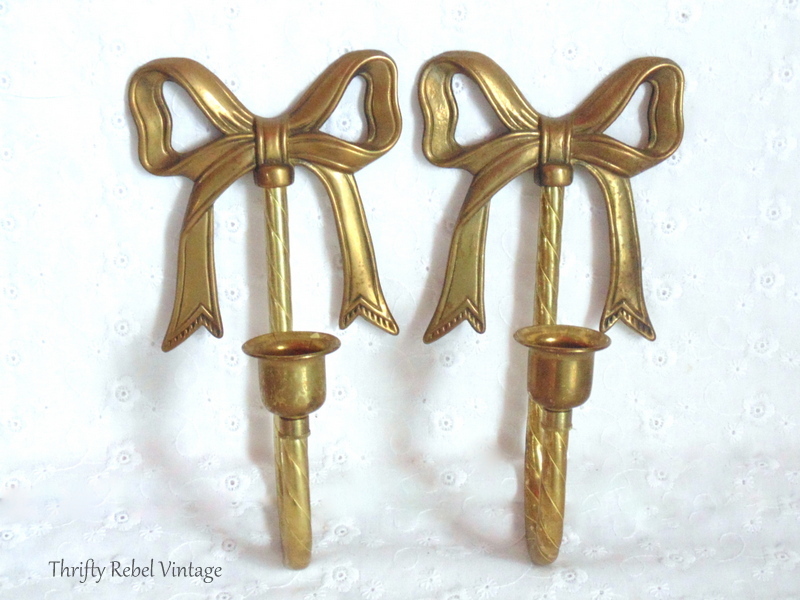 What adorable brass pieces. I’m a Georgia peach so I especially love the southern belle! Thanks for the giveaway. Very nice pieces and very generous of you to offer these giveaways! 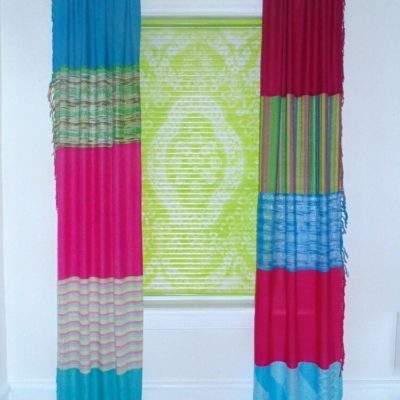 You always have such wonderful and interesting pieces and these are no exception! I enjoy seeing what you come up with! 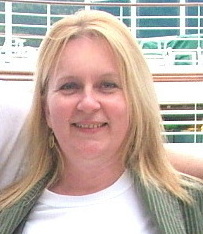 I really enjoy your blog and I have learned so much. Thank you.